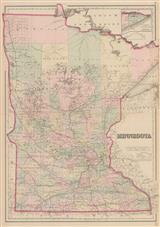 Description: Decorative map of the state of Minnesota, with inset map showing the shores of Lake Superior. Original colour. Description: A pictorial miniature map with vignettes including flour processing. Printed colour. Description: St Paul. City plan. Original Colour. Description: Minneapolis. Steet plan. 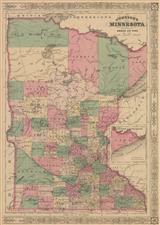 Inset map of larger scale. Original printed colour. 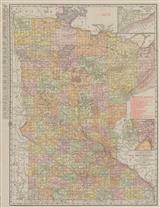 Description: Large map of Minnesota divided and coloured by county. Railroads are marked with red numbers according to a legend. Printed colour.